You are here: Home / Design / iMasons: Do Older Data Centers Have a Future? MONTE CARLO, Monaco – The data center industry has changed a lot over the last 20 years. Many of the earliest data centers were built in a time of very different requirements for IT equipment and energy efficiency. Do these aging legacy facilities have a future? Can their life be extended by repurposing them for new uses such as cold storage or blockchain technology? These questions framed the “Think Tank” discussion session at the recent Infrastructure Masons meeting in Monaco, held in conjunction with the Datacloud Europe 2018 conference. Nearly 100 industry thought leaders from around the globe discussed the prospects for older data centers in a free-ranging conversation that sought to identify options and obstacles. The bottom line: A limited number of older data centers are candidates for updates, but many others would require major investment to handle new IT workloads and densities. The economics of retrofitting aging data centers, even for workloads requiring lower density or variable resiliency, significantly shrink the pool of candidates. Stranded Investment or Opportunity for Innovation? Data centers represent an enormous capital investment, with requirements for power, cooling and network infrastructure that are quite different from traditional office or industrial facilities. Many legacy facilities have low ceilings, limited fuel storage and lack of options for expelling heat. It’s difficult to run new fiber to support requirements for next-generation networking requirements. A common concern is that focusing on extending the life of older facilities represents an inefficient use of capital, and the money would be better spent on new capacity. 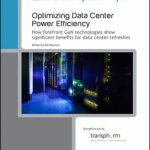 One potentially promising scenario is the use of data center modules to extend a data center’s life, supporting power densities that would allow more IT capacity to be used in the same power envelope or footprint. These modules could be installed into existing space, or added in adjacent rooftops or parking lots. Any decision on the viability of a retrofit project would require an extensive assessment and “decision matrix” to identify the variables that would have the greatest impact on project economics. The iMasons were asked to consider whether older facilities could be re-tasked to support new workloads with density or resiliency profiles that require less intensive infrastructure. These could include cold storage, which Facebook has operated in facilities in warmer and lower-density facilities, or cryptocurrency operations that run on grid power. Think Tank participants generally saw cold storage as a more likely option than cryptocurrency mining, which tends to be loud and power-hungry. Alternative uses are options for some landlords looking to extend the commercial life of aging data centers. iMasons suggested that these could include self storage, startup incubators, or electric car charging facilities. One working group suggested that indoor “vertical” farming could be a promising use case, including as grow rooms for cannabis in states where it is now legal for medical or recreational use. A question to ponder for a future discussion: Will the data centers we are building today have a longer life expectancy than those built in 1998 or even 2005? 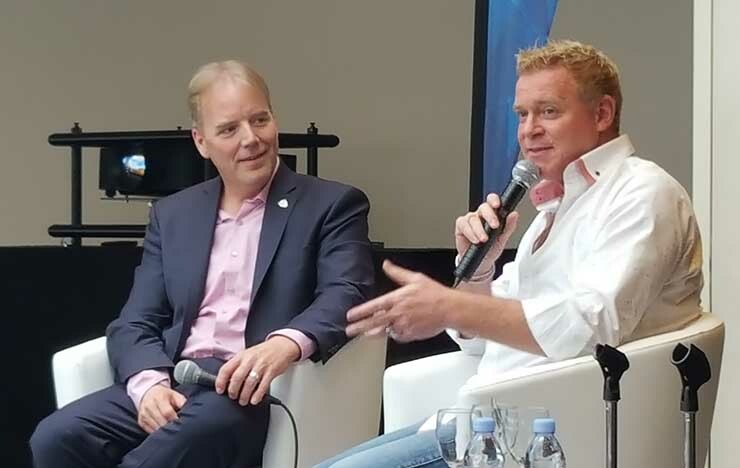 The Think Tank session was preceded by a fireside chat between Infrastructure Masons founder Dean Nelson and Michael Tobin, the entrepreneur and philanthropist. Tobin has also forged a bold path as a philanthropist, most notably by running 40 marathons in 40 days (no, that’s not a typo), raising more than £100,000 for The Prince’s Trust, which supports struggling young people. “For me, philanthropy is a selfish act, because my kids will grow up in a better world,” Tobin told the iMasons. 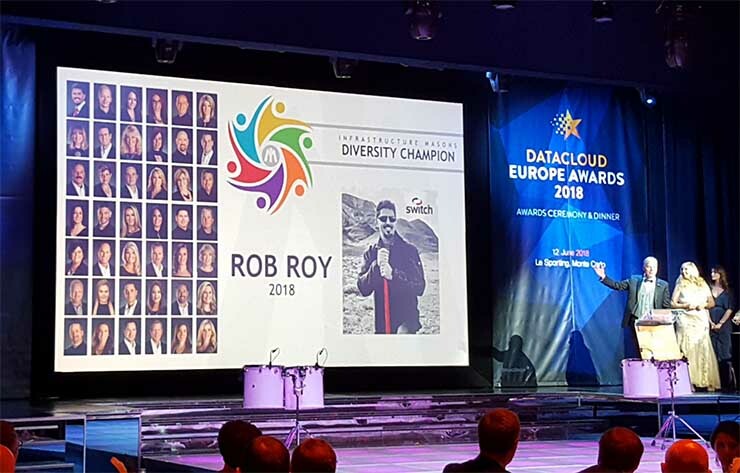 At the Datacloud Awards on June 12 in Monaco, the Infrastructure Masons presented their first Diversity Champion award to Rob Roy, the founder and CEO of Switch, which has led the industry in filling its executive team with women. The award was presented by Nelson and Dr. Julie Albright, who was recently appointed to the advisory board for Infrastructure Masons. Women occupy 50 percent of the C-level leadership positions at Switch, including CIO Missy Young, COO Lesley McVay, Chief Construction Officer Terri Borden and Chief Brand Officer Kristi Overgaard. It’s a pattern seen throughout the Switch executive ranks, and a contrast to the data center industry’s historic trends.